As we reach the end of 2018, it’s only right that we take a look back on what an exciting year it has been for electric cars. 2018 has been a year that has continued the decade’s increasing focus on global climate change, with countries all around the world reacting (in different degrees) to the problems we tackle as a whole due to carbon emissions, many of which are directly tied to transport. Policies are being formulated, EV targets set in place and a lot of ground made by carmakers who are seeing the writing on the wall for the internal combustion engine as fuel emissions standards tighten across Europe and the US. While the rest of world has been getting on with it – Norway for example where electric cars make up over 50% of all registered passenger vehicles, or the USA where EV pioneer Tesla is succeeding to change the face of transport and energy despite massive criticism, predictions of failure and production delays. Israel and Denmark have both announced that from 2030, petrol and diesel cars will no longer be allowed for sale, while Madrid has banned ICE from its city centre in a bid to improve a horrendous air quality record. General Motors and Volkswagen have both put it on record that they will completely stop making ICE vehicles, instead turning their focus to zero emissions vehicles. In Australia the Electric Vehicle Council has been hard at work making the case for electric vehicles and pushing for change in policy, while industry stakeholders have submitted their views to the Senate Select Committee for Electric Vehicles (the outcomes of which we are keenly awaiting here at The Driven). Brisbane-based Tritium have become a world-leader in EV charging infrastructure, developing an EV charger that can add 150km range in just 5 minutes, closing a deal with European EV network Ionity and installing 50 ultra-fast chargers here at home. Melbourne’s ChargeFox is rolling out Australia’s first interstate EV charging network that will join up with the Queensland Electric Super Highway, that will see drivers of EVs able to traverse Far North Queensland all the way to Adelaide thanks to funding from ARENA, motor clubs and founder of CarSales Greg Roebuck. All in all, a big year, and no better way to end it than take a look at 10 of what we here at The Driven consider to be the most groundbreaking cars of 2018. From best sellers to price drops, fast cars to firsts, and why they made our list: here they are. Without a doubt the biggest gamechanger for 2018 has been Tesla CEO Elon Musk’s mass-market Model 3. Following the more expensive Model S and Model X (the introduction which have been the stepping stone for Musk’s strategy to disrupt the ICE industry), Musk unveiled his more affordable electric sedan in 2016 and received 325,000 reservations within the first week. 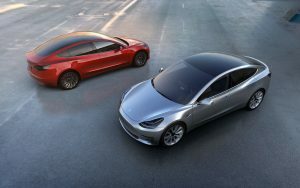 The first Model 3s rolled off the factory floor in the USA in July 2017, and though production took some time to pick up speed resulting in the creation of the famed general assembly tent in Tesla’s carpark, by the third quarter of 2018 the Model 3 became the 5th best-selling sedan in the USA, with 100,000 Model 3s sold since launch. 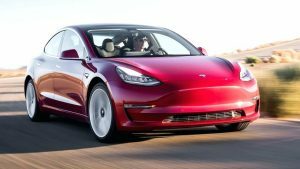 According to US automotive safety agency NHTSA the Model 3 is also the safest car it has ever tested, gaining not only a 5 star safety rating but also coming in with the lowest probability of injury based on NHTSA’s test results. While Hyundai’s Ioniq all-electric model has been on the market overseas since 2017, it has made our list for one very important reason: it is the first electric car in Australia to come in under $A50,000. Australia’s uptake of electric vehicles lags behind the rest of the world, with fingers pointing at a number of reason – lack of infrastructure and policy, for example – but it has to be said, the biggest barrier is possibly simply that there are not enough models here at a price to suit most Aussie consumers. 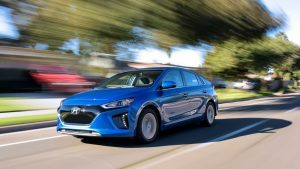 The Hyundai Ioniq – in three powertrains – has now been on the market here for just a few weeks, with consumers champing at the bit to book in a test drive. Word on the ground from both Hyundai head office, dealerships and consumers is that it is the all-electric version with 28kWh battery and 230km real world range that people want – a surefire indicator that the electric car market in Australia is geared up and ready to take off. 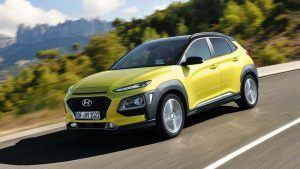 It was a toss up between Hyundai Kona and Nissan Leaf for third place, but the Kona wins as it is the next all-electric car model that Australians will be able to take for a test drive, with Hyundai promising it will launch it on the market here in early 2019. While pricing for the all-electric Kona SUV with 64kWh battery (the long-range version that will be the only model on offer here in Australia) has not yet been confirmed, word is from a spokesperson at Brisbane’s recent AEVA conference that it will be in the $A53,000-55,000 price range (before on road costs). With 500-600km range according to various real life tests, that’s a lot of bang for your buck. The Kona EV has also been bagging awards all over the place, tipping it to be another winner in the electric car marketplace. 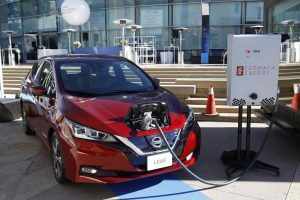 The zippy Nissan Leaf has been doing well overseas and the 2019 model with a boosted range of 270km and 40kWh battery is much anticipated by EV drivers for its return to Australia in mid-2019 after Nissan pulled it from the market here in 2012. It reached 100,000 sales in Europe in June 2018, proving itself a mainstay in the electric car market. But the reason it has made The Driven’s list is Nissan’s innovative vehicle-to-grid technology (V2G), which is is integrated into the 2019 Nissan Leaf and is designed to help drivers lower costs by providing energy backup during peak energy demand times. It also has the potential to help balance the troughs and highs of the power grid that demand that tends to send electricity prices up. 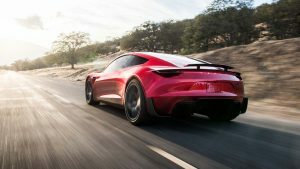 Although slated for production in 2020 and well outside the price range of most punters, the return of the Tesla Roadster makes the list for one pure, simple, fact: it is the fastest car in the world. The acceleration of the Tesla Roadster is whiz bang: from zero to 100km/hr to just 2.1 seconds. That’s insanely fast – faster than a Porsche 918 Spyder, to be exact. The Rivian R1T pickup stole the show in Los Angeles last month when it debuted at the LA Auto Show. The idea of an electric ute – as pickups are called here – has attracted a lot of attention thanks to Tesla CEO Elon Musk, who put the idea out there earlier this year on Twitter with a round of enthusiastic response. 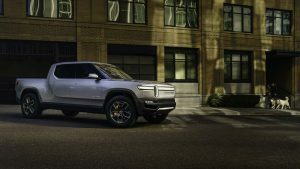 An electric ute is definitely high on Musk’s to-do list, but Michigan-based startup Rivian, led by innovator R.J. Scaringe, may have pipped Musk at the post with his electric Rivian R1T, which will be available with either a 135kWh or 180kWh battery with a top range of 660km (projected). We can’t imagine a tradie not wanting an electric ute, particularly if it is able to power his/her work tools as well. 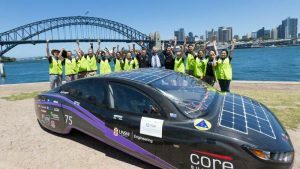 It’s not available as a production vehicle, but this 6th-generation solar racing car built by UNSW students made our list because it is now, as of December 2018, the most efficient car in the world. Driving 4,100km across Australia from Perth to Sydney in just 6 days, the five-seater dubbed “Violet” by its creators clocked just 3.25kWh per 100km, 17 times less than the average Aussie passenger car, and beating the previous record of 5.5kWh/100km. The Sunswift team will be taking Violet to the 2019 Bridgestone World Solar Challenge from Darwin to Adelaide, a gruelling 3,000km race which attracts competitors from across the globe.